A psychopath who strangled and cut up a gay trainee rabbi with a ripsaw has been jailed for the rest of his life. Thomas McDowell, 27, throttled Andreas Hinz, then dumped his head, limbs and torso in bin bags in Camden, north London. The body parts were found when the uncollected rubbish attracted flies. 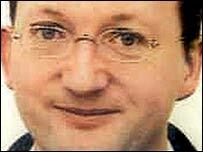 McDowell, born in Ballymena, Northern Ireland, was told by the judge at Southwark Crown Court he remained a serious danger to the public. McDowell suffered abuse as a child and grew up hating homosexuals, the court had been told. He had admitted manslaughter on the grounds of diminished responsibility. But on Wednesday, the jury found him guilty of murdering Mr Hinz, a 27-year-old German national, on 3 July, 2002. Judge Geoffrey Rivlin QC told McDowell the only appropriate sentence was one in which he would spend his whole life in prison. "You are a dangerous psychopath. There are no two ways about it," he said. Judge Rivlin accepted McDowell had suffered abuse at the hands of a man who was later jailed. He told McDowell it was not his fault he had developed a serious personality disorder. But he said McDowell remained a danger, particularly to homosexuals. "There are features of this case which, in my judgment, make it one of the more serious and which, first and foremost, calls for the protection of the public. "I do not know whether it will ever be thought safe to release you into the community," said Judge Rivlin, giving a "whole life" order. McDowell was take from the court to Rampton High Security Hospital, where he will serve the first part of his sentence in the personality disorder unit.